around the hair in this area. . . .
Piture: Location of measurement spots on the reverse side of the Sudarium of Oviedo. The Sudarium of Oviedo and the Shroud of Turin are two relics attributed to Jesus Christ that show a series of amazing coincidences previously described. These similarities suggest that both cloths were used by the same personality. In this contribution, we describe the X-ray fluorescence analysis performed on the Sudarium and we highlight a new fascinating coincidence with the Shroud and with the place of the Passion. Among the chemical elements detected, the concentration of Ca is the most reliable one. It is associated to soil dust and it shows a significantly higher presence in the areas with bloody stains. This fact allows us to conclude that the main part of the Ca located in the stained areas was fixed to the cloth when the physiological fluids were still fresh or soon after. As the stains have been correlated with the anatomical part of the deceased man, the amount of Ca can also be related with his anatomical features. The highest content of Ca is observed close to the tip of the nose, indicating unexpected soil dirt in this part of the anatomy. A particular presence of dust was also found in the same place in the Shroud providing a new and astonishing coincidence between both cloths. The low concentration of Sr traces in the Sudarium, even lower in the stained areas, matches also well with the type of limestone characteristic from the Calvary in Jerusalem. This new finding complements two other recently publicized: The ponytail shape of the Man of the Shroud hair, whose origin is justified by the use of the Sudarium of Oviedo and the alleged presence of a scourge mark in this cloth. Such a gathering of evidences strengthens the tradition that both cloths have wrapped the same body, that of Jesus of Nazareth. Who first thought up the idea of a pigtail? Every depiction of the Shroud from the Lier copy onwards shows the long hair round the back of the head. The pigtail effect is only where the original has deteriorated. The point remains that there is the assumption that the Image on the Shroud now is the same as the image of the Shroud in some previous century when quite clearly it is not. Obviously one can discuss what were the differences between now and then at different points in the past centuries but to assume that the Shroud has been physically inert for centuries is very unlikely in view that it has not been given special conservation care. The main point of the paper is not the ‘ponytail’, but the coincidence between the calcium deposits between both pieces. The sudarium is not a paiting, there is no image of any kind AFIK, which means no gesso. So then, if deposits of the same type are found in exactly the same locations that makes the case interesting. Why? Because the pieces are C14 dated centuries apart. The main point is that two independent radiocarbon labs have dated the “sudarium” between the 7th and 9th centuries. Another invisible mending? Just weeks before the congress took place, new samples from the Sudarium were subject to carbon dating. Five samples were dated from five different cloths –three of them came up with the expected date, while the cloth from an Egyptian mummy returned a date of any time in the 19th or 20th centuries. The laboratory immediately concluded that the cloth (and the mummy) were fakes. The sample from the Sudarium was dated to around 700 AD. Scientist César Barta spoke about the carbon dating process, emphasising the fact that if carbon dating is always absolutely accurate, then we could just as well finish the congress there and then. However, there were several points to bear in mind – in specialist carbon dating magazines, about half the samples dated come up with the expected date, around 30% with an “acceptable” date, and the other 20% is not what one would expect from archaeology. 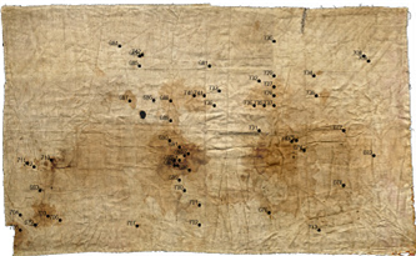 The laboratory used (via the National Museum in Madrid) said they were surprised by the result and asked if the cloth was contaminated with any oil based product, as oil is not cleaned by the laboratory processes used before carbon dating and if oil is present on a sample, the date produced by carbon dating is in fact the date of contamination. I would like to know more details about the dating of Sudarium. Nevertheless given the correspondences between the Sudarium and the Shroud, and that it seems that they covered the face of the same man, there is a contradiction</B< between 1260-1390 AD dating for the Shroud, and circa 8th century for the Sudarium. Probably neither of these datings is correct. I don’t know any radiocarbon dating done by the “National Museum” in extremis. It is more, I don’t know any “National Museum” in Madrid. I know two previous dating made by the well reputed labs of Toronto and Tucson. It would be useful to know where these scandalous results of the test were published. In the official webpage of the “Centro Español de Sindonología” nothing is said about the radiocarbon dating, that is a subtil way of lying. Antonio Alonso was the unique independent participant in the scientific enquiry about the Sudarium of Oviedo. He is member of the Instituto Nacional de Toxicología y Ciencias Forenses (National Institute of Toxicology and Forensic Sciences). He is contrary to the position of Barta and had said: «La única evidencia científica es la del Carbono 14 y dice que la reliquia es falsa».”(“The 14 carbon is the unique scientific evidence we have and it says the relic is false”.) “…no estamos dispuestos a mantener un bulo». (“ We are not willing to support a hoax”). I don’t know any radiocarbon dating made after 1988 with a failure of 700 or1300 years. This is possible when some contaminant circumstances are detected or when the test was made in previous years, when de radiocarbon test was beginning. This is not the case of the Shroud of Turin. When two (or are they three?) labs coincide in the dating of a piece archaeologists are clear: this is strong evidence and no hearsay or indirect hint can contradict it. What makes you think that I’m defending that? You need to give the agenda a breather, David. The correlation between both pieces is not equal to authenticity, but it is interesting. Can anyone elaborate which “Egyptian mummy” specimen is cited there? Sudarium is claimed to be heavy polluted by soot, wax, oil, smoke from the candles, even explosives (it was bombed by anarchists in 1934) and lipstick. it has a hole in the center made by the wax falling out of the candle. So -in theory at least -it is likely that the results are skewed. But of course I would like to know more details. And as it seems that Shroud and Sudarium covered the same face, the results -660-890 AD for Sudarium, and 1260-1390 AD for the Shroud -are incompatible, and thus unreliable. A Soxhlet purification process, which I believe is standard in cases of suspected organic contamination, would have removed the pollutants. What was the cleaning regime? Truly, I would like to know myself, as all the informations on carbon-datings of the Sudarium are scarce and reported by non-specialists, like Bennett and historians Guscin and Hesemann. Just I would like to remind on the Barrie’s site, on the Valencia conference page (http://www.shroud.com/valencia.htm ), there is listed a paper called Dating the Cloths by the C14 Method – The Oviedo Sudarium by Felipe Montero Ortego. Unfortunately, it seems to published nowhere on the Internet. I planned to contact Ortego about this paper, and ask him whether he could allow Barrie to publish it -yet lacking time, and not hurrying with it, I haven’t done it yet. But of course someone may try to do it before me.